Whistling, dancing, and clapping like one trillion overjoyed church fans, the ocean’s waves ceremonially spool in with the wind and satisfactorily twirl out with amnesty and accord. North, South, East to West they motion the moon and sanction the sun to give rise to their emotional tango. A majestic sound of unity, the flux tucked in the ocean and the blue hue of the sky command us to appreciate their universal offerings. Each day, blue and new, the sky and ocean consecrate our approach with gratitude and dependability. A colour emblematic of a calming spirit, blue is the hue of the ocean, sky, sleep, and twilight. It’s healing and abundant nature give way for us to relax, while rebooting, and communicate while creating. Psychologically, we associate the color blue with the night because it helps us to sleep and be at peace with our material world. Just as the blue waters stimulate insight, mindfulness, and spirituality, the blue skies enhance our feelings of security and allow us to trust with good judgment. Mellow like the yellow Sun, the stability of blue grants a calm abiding, sparking us to feel inspired and in control of our mental thoughts. Physiologically, deep blue invigorates the pituitary gland, which regulates sleep patterns and help to reduce insomniac nights. As it relates to career, blue is inspirational and stable, yet candid and clear. It’s essence increase a hunger for knowledge and desire for proficiency, hence, the recommended attire for employment and traditional requirement for police officers. When worn as a garment, opposite of the energetic color of red, the tranquil color of blue affords us serenity and a balanced momentum. Blue lowers the blood pressure, while red tends to excite it. The color blue is demonstrably associated to the throat chakra and thyroid gland. It’s purpose is to learn to take responsibility and accountability for one’s own needs. It is the component of the vocal track that makes way for creativity and channel of expression. The Fifth Chakra is, ultimately, our connection to the world. The healthfulness of this chakra directly relates to how we express ourselves. Honestly. Lying, through the tongue, violates both the body and spirit because all of the choices we make have consequences on an energetic level. The common expression ‘lump in our throat’ is symbolic, but evident when we find ourselves at a crossroad. Not ironically, when a physical dysfunction develops, such as sore throat, laryngitis, mouth ulcer, scoliosis, voice problems, gum issues, or swollen glands, our ability to speak up for ourselves has been diminished and we become unable to make concrete choices for ourselves. Emotionally, we swallow anger, fear, personal expression, criticism, – even faith. We refuse change in every way possible. And when we don’t speak up, we ultimately give our power away. 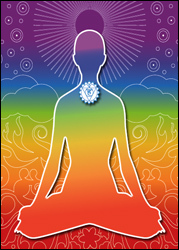 The critical challenge of the throat chakra is not only to assimilate information – but also to express ourselves in the most truthful manner. A sacred space of authority, the ocean is an influence we grow to respect. Our encounter with it can teach us many things about our emotional immovability and spiritual awareness. 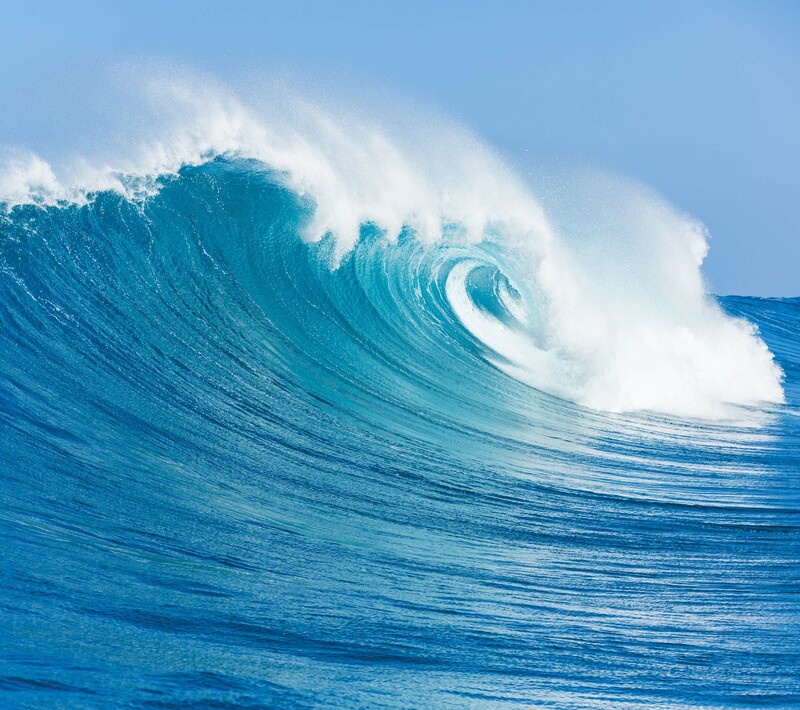 Like a tidal wave, the lessons in our lives can be beneficial, yet impactful. At the oceans front, when we choose to develop a calm mind instead of an agitated stance toward life and all its challenges, we recognize that we are the student – and the ocean is the teacher. The devotion of the deep blue ocean and the sincerity of the sapphire skies bestows us a heightened sense of balance. Balance, for most, comes in waves. Like the ocean, we find ourselves in flux more often than not and due to the most trivial of issues. Rarely do we remain still like the sea. But when we surrender and make our emotional security a priority, balanced is restored and personal power, achieved. The energy from the color blue can aid us in getting the balance right. On any given day it enhances personal growth, stability, wisdom, resourcefulness, and self-control. It allows us to look beyond ourselves and increase our perspectives outward. As you move forward, the challenge for equilibrium will rock your boat in the same way it always has. There will always be flux. There will also, always be peace, if you allow. If it seems as if your sense of steadiness is drifting into the deep dark waters of bewilderment, perhaps, it’s only because your emotional circumstances are showing you so many waves of worry that need to be calmed. Find a quiet space in the ceiling of the sky. The motion of the ocean doesn’t have to sail you adrift.